We enjoy our Tegu Pocket Pouch Block Sets and they often come with us on road trips. 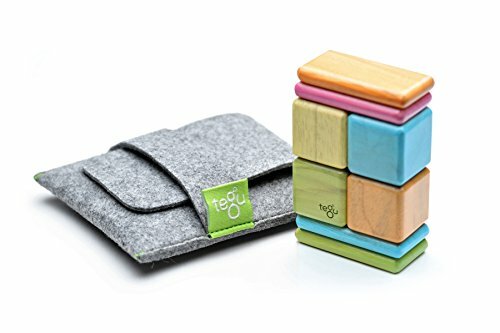 They come with 8 of Tegu's wooden magnetic blocks - 4 cubes and 4 short planks, and a felt pouch to store them in. They are just enough to get a child's imagination going while strapped to a car or booster seat! If you're not familiar with these blocks, Tegu makes high quality wooden blocks with magnets embedded in them. They allow you to build and create with wooden blocks in a way not possible with standard blocks. For example, with typical wooden blocks you can only stack on top of each other, but with Tegu, blocks can be connected on the sides and built outward. And the creations, such as the airplane below, will stay together as the child zooms it through the air! Below are just a couple of the items my boys build with their Tegu Pocket Pouch Sets - an airplane and robot, but they have built much more. Tegu builds their blocks from responsibly harvested wood from the Honduras, giving back to the community that builds them. You can read more about their story here. 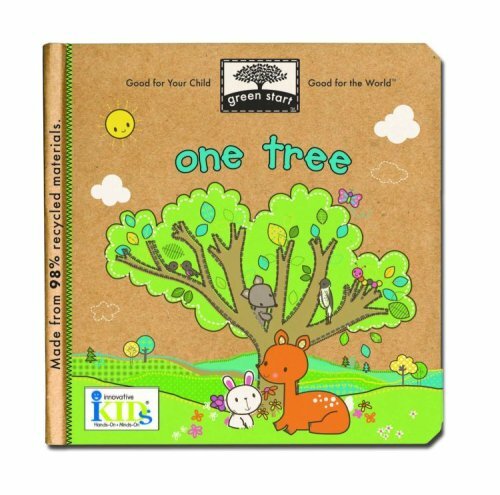 Fitting with these wooden blocks we gave the book One Tree which is about a tree through the seasons and made from 98% recycled materials with eco-friendly inks. I wish more books were made of recycled content, and I hope to see this shift happen soon. I like that in the back of the book there is a page all about how trees help us by producing oxygen, filtering water, absorbing rainfall, absorbing carbon dioxide; and another page about what we can do to save trees such as using reusable bags, using both sides of paper, looking for chlorine-free papers, and recycling.